New Yorker Frank Burghduff first came to Panama City in the winter of 1936-'37 and fell in love with the place. The next year he returned and in 1939 began construction of THE OLD DUTCH TAVERN. It took two years to build out of cypress logs and handmade shingles. 113 tons of stone were used in the construction of the fireplace. The OLD DUTCH operated every tourist season until 1976. Photographs of the interior and exterior of THE OLD DUTCH are desired for this research project. Burghduff advertised that over $10,000 dollars worth of curios were on display inside the tavern. From a 1942 ad,"Don't fail to bring your friends to see the $10,000 exhibit of curios from all over the world, free of charge." The western portion of Panama City Beach was so isolated that planes could land on the beach. 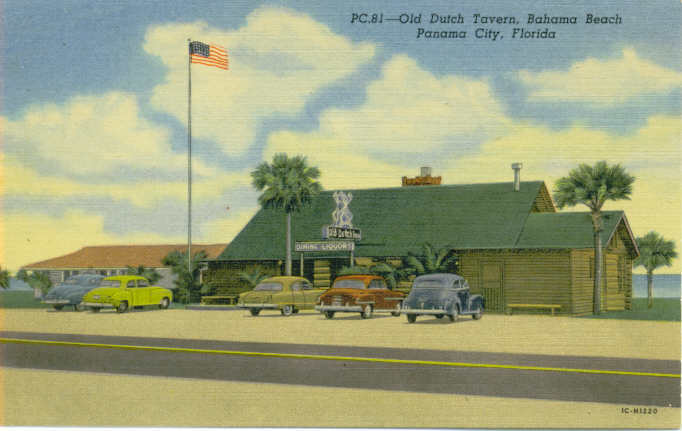 The Old Dutch was the original bar on Panama City Beach. Many musicians got their start in show business playing gigs at this tavern seven days and seven nights a week. Burghduff's wife Etta died in Dothan in September of 1939. By 1942, there was a new Mrs. Burghduff. Burghduff was accused of being a Nazi spy during World War II. This may have been a ploy to force government confiscation of his valuable property. By the early Fifties, Birmingham's C.F. "Cliff" Stiles owned the Old Dutch. He built an adjoining motel and eventually owned many other properties in the Panama City area including two Holiday Inns, the Dixie-Sherman Hotel and various cottages. Stiles routinely hosted conventions of the Alabama Hotel Owners Association in Panama City. In 1963, Stiles announced that he was building the first Holiday Inn on the beach on property just west of THE OLD DUTCH. When the Holiday Inn opened for the 1964 tourist season, it was advertised as the tallest building on the Gulf of Mexico (four stories and 100 rooms). PHOTO COURTESY OF BILL ELROD~ This single un-air conditioned room was the free accommodations Stiles provided for bands that included five or more members. In 1970, rooms at THE OLD DUTCH ranged from $6 to $15 a night but this was far too expensive for musicians. EDITOR'S NOTE: Since the coming Labor day climaxes the traditional trek of Tri-State neighbors to the local beaches, we thought it appropriate to take a peek at how these neighbors may view us from a tourist's standpoint. Here is the way Tom Sellers, writing in the Columbus (Ga.) Ledger column "Valley Echoes", offers as a public service an inside view into the life of a beachcomber at Panama City. Almost every resident of Georgia and Alabama finds himself in Panama City one time or another. The beaches west of that city have become a sort of summertime Riviera. And like a lot of others, I succumbed during the past in the strange allure of the white sands, impassive green Gulf of Mexico, and the cool sea breezes. There are pitfalls for the average tourist in Panama City, however, and before going there, one should make certain be is adequately prepared. First of all, one should never leave home without being well supplied with pictures of Presidents and early American patriots. The natives of Panama City are uncommonly fond of these trade items and are partial to those printed in green ink bearing portraits of Ulysses Grant, Andrew Jackson, Alexander Hamilton, Abraham Lincoln and George Washington- in that order. Tourists will learn that these little pieces of paper will fetch them all kinds of special consideration such as room and board, native trinkets, entrance to snake-handling establishments,etc. Silver coins are acceptable but one will need a great many and these are apt to be rather burdensome. In a bathing suit, a person ought to travel as light as possible. One thing that visitors to Panama City should know is how to get along with teenagers. Young people are far more numerous and active along the beaches than mosquitoes, and since there are no effective teenage repellents on the market, one should study their habits and be ready to cope with them scientifically. For some reason, high school and college students on vacation love to congregate at a few approved places such as the Long Beach Resort and the Old Dutch Inn. It appears that they are happiest in large groups- several hundred at a time- and they are most plentiful around juke boxes, hot dogs and big iced drinks. At Long Beach Hangout, for example, there are three music machines operating beneath the pavilion beside the rockin'-and-rollin' cult. Normally, you will hear three different records playing at the same time, and this makes for an unbelievable jumble of sounds. Imagine, if you can, the following scene: One juke box is giving forth loudly with "Ahab the Arab" and has its own select following of bathing suit clad youth. A few steps away is another box featuring Ray Charles' "I Can't Stop Loving You"- also with its own little group. Beyond that is still a third crowd, larger than the others, patronizing a machine producing a weird African beat. Thirty or 40 admiring young females. And on the dance floor, two of the girls are dancing with each other. However, the step is not quite like anything you have ever seen before: it is a cross between hop and twist. The species of teenager that visits Panama City is a hardy type; he is apparently immune to bad food, dangerous traffic and blistering sunshine. One adult driver had a nerve-shattering experience about sundown when the beach highway was filled bumper-to-bumper, and the boys and girls were swarming to their various rendezvous. This driver, hands shaking, recalled later a brash youth had dashed in front of his car and was hit squarely while the horrified motorist was slamming on the brakes. The boy soared into the air, sprawled on the highway, and immediately picked himself up, brushed off his bathing trunks and disappeared into the throng while the man stood there trying to collect his wits. The best approach to Panama City, I have learned, is to rent an air-conditioned motel room or cabin, stock it with food-and stay there. Occasionally you will want to run out and paddle in the surf or lie on the sand in the hot sun until you begin to turn pink. But the night life and the highways require a stout heart- you will invade them only at your own risk. Outside of these considerations, you will find that Panama City is a perfect vacation spot. But you should never visit the beaches expecting to find peace and solitude, because several thousands of your friends and neighbors will be there looking for the same thing. And the safest thing to do is stay at home. But who wants to be safe?